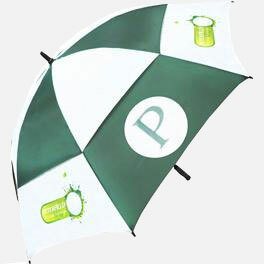 This is one seriously tough vented promotional umbrella. Featuring flexible, 75 cm (approx. 30″) “Storm-proof” fibreglass ribs, a quality rubber handle and double layer top cover/pressure release vent for increased resistance to wind. Screen print available on 10 different coloured canopy options this makes for an outstanding value advertising and vented promotional umbrella. Length 100 cm (approx. 40″). Canopy width 150 cm (approx. 60″). If you’d like to learn more or place an order, call us on 01525 382 938 or contact us today!